I write when and wherever I can, so this is a compilation of that facet of my life: the "All Things Caput Mundi" section below will help you find (you guessed it!) everything on Rome, from my city blog YoungInRome to articles I've written as a Rome ambassador for Like a Local City Guide as well as other other fun collaborations. "Travel & Other Adventures" will take you to articles I've written as a contributing writer for Elite Daily, as well as other tidbits I've gotten to work on about the world outside of the boot. "Book Reviews" will instead, wait for it, bring you to the reviews I've written for the lovely folks over at iRead Book Tours/Italy Book Tours as well as a few freelance pieces, and finally scoot on over to "Pictures & Words" to hop over to my Instagram page for visuals and thoughts on Italy, Tunisia, lots of other travels and a touch of the whimsical everything else. A smidgen about me: growing up bouncing back and forth between Rome and Northern California, I eventually moved back to the Eternal City to finish college and then decided I liked gelato too much to move away again. Today I split my time between Tunis, where I work for an international humanitarian organization, and wandering around my beloved Roma in constant search of bookstores and the perfect espresso. Below that you’ll find a series of buttons: the "All Things Caput Mundi" section will help you find (you guessed it!) everything on Rome, from my city blog WhichWaytoRome to articles I've written as a travel writer for Devour Tours and as a Rome ambassador for Like a Local City Guide, as well as other fun collaborations, including an audio tour through my favorite part of the city. "Travel & Other Adventures" will take you to articles I've written as a contributing writer for Elite Daily and other tidbits I've gotten to work on about the world outside of the boot. "Book Reviews" will instead, wait for it, bring you to the reviews I've written for the lovely folks over at iRead Book Tours/Italy Book Tours as well as a few freelance pieces, and finally click on "Pictures & Words" to hop over to my Instagram page for visuals and thoughts on Italy, Tunisia, lots of other travels and a touch of the whimsical everything/where else. 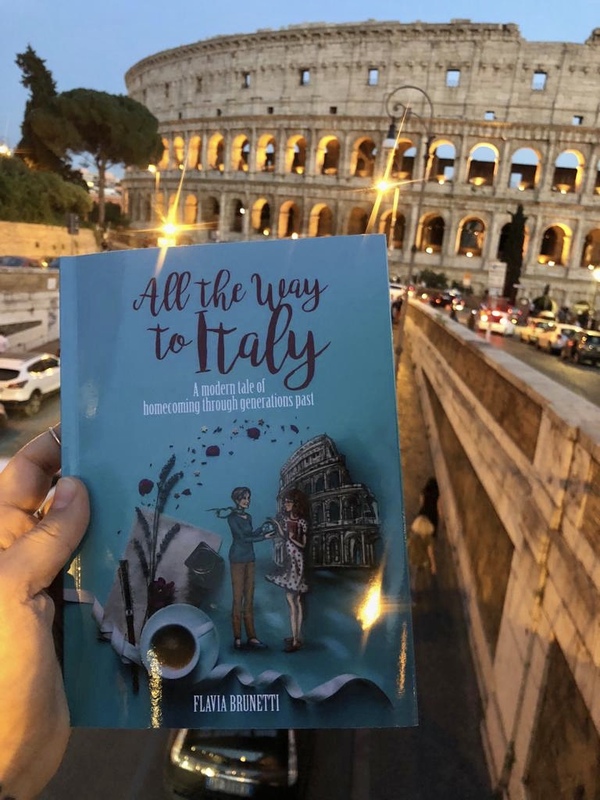 My debut novel, All the Way to Italy: A modern tale of homecoming through generations past, was published by the amazing Ali Ribelli Edizioni in April 2018. You can click on the image on the left to head to Amazon.com, but it’s also available through most online outlets, both in ebook and paperback, and you can also request it at your local bookstore! You can also check out the book and read some reviews (as well as write one of your own!) over on Goodreads. Publishing this book was the dream of a lifetime for me, and I’d be so thrilled to hear what you think. Cinzia Bolognesi, an amazing Italian illustrator, did me the very great honor of creating the cover and interior illustrations for All the Way to Italy. She’s pure magic; you can click on the picture ABOVE to check out her character study and process for the book cover and images, including the map of the places that little visits in the book, which makes me grin like a maniac every time i open to the inside cover of the book! The rest of it: collaborations and articles on the world outside of Italy! BOOK REVIEWS: MOSTLY ITALY-ORIENTED WITH A FEW OTHER GENRES SCATTERED THROUGHOUT. Merging pictures with accompanying thoughts: hop over to my Instagram page! a proud member of the iread team of professional book reviewers! CLICK the image above FOR THE WINNING ENTRY AND MORE INFO! Flavia Brunetti Proietti, Which Way to Rome®, All the Way to Italy©, and FlaviInRome, 2019. Unauthorized use and/or duplication of this material without express and written permission from this site’s author and/or owner is strictly prohibited. Excerpts and links may be used, provided that full and clear credit is given to Flavia Brunetti Proietti and the publisher of the article cited with appropriate and specific direction to the original content.